Replacing an existing ranch style that sat below the street, with the ridge of the roof just at eye level from the street, this house challenged the traditional house design. In an area of either major renovations or tear downs, this family wanted to stay put, but faced the dilemma of which path to take. After a quick study of the familyâ€™s list of desires and the condition of the existing building, the decision was made to start from scratch. The only element of the existing lot to be retained was the pool, rebuilding it would be out of the range in this construction budget. Thus, the challenge of the pool on the rear of the house, the existing grade, and the front setback squeezed the design constraints. Placing a center hall farmhouse colonial on the property, the design works well because of the linear nature of designing for contemporary living. With a nicely apportioned garage on the right hand side, a link with everyday entry, and the main volume of the house on the left, the house was not excessively deep, allowing light into every space. Twisting the linear formation to accommodate for the pool, the house began to settle on the lot and begin to work the grading for entries, terraces, decks, and garage doors. The stone clad, traditional colonial style of this center hall house dictated a five bay wide box with an understated entry. Off of the center hall is the traditional Living Room on one side and the formal Dining on the other. 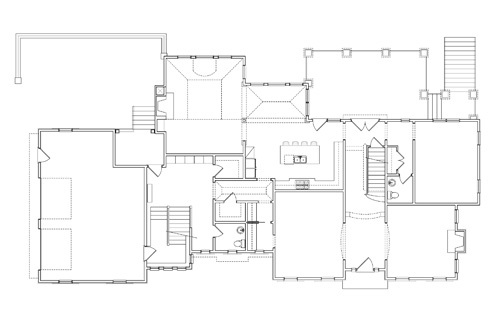 To the rear is the center of everyday living, the Kitchen, Breakfast Nook, and Family Room grouping. The center hall allows for direct access to the front and rear of the house under the stair landing. 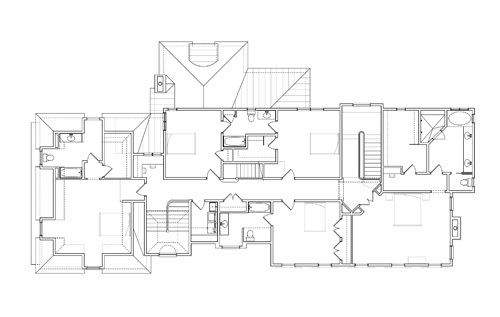 The connector portion of the house would contain the Family Entry, Powder Room, entrance to the garage, and rear stairs. The stair proved to be a design opportunity, creating a focal point to the rhythm of the house, instead of providing the typical shed roof over the diminishing stairs, a tower form was created to punctuate this area of the house and allow for light into this portion of the house. The garage follows the hipped roof form of the main house box, but set down due to the change in grade and on knee walls to reduce the ridgeline height. Siding is introduced above a stone water table to reduce the monotony of the materials. Even though the landscape architect had been on board for some time, a decision to flip the house, garage on the left, was made, influenced by better topography. The similar challenges of the design still held true, but the garage rose two feet closer to the main house floor level, access to the garage was more dramatic via the driveway, and the existing swimming pool was now centered off of the rear terrace, inline with the center hall. The most challenging portion of this design was the elevated stone terrace, over a lower stone terrace. A system of reinforced concrete was selected for a sturdy and long lasting solution. 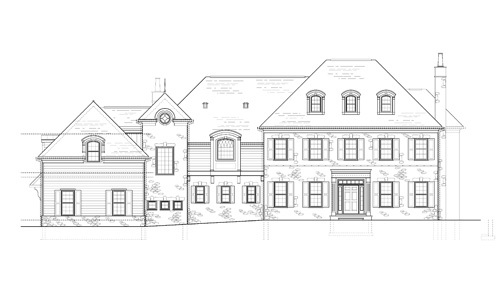 This custom house for clients wishing to reinvent their existing lot has seen an enormous transformation of their lot, creating a dynamic landscape and stately colonial farmhouse. By breaking up the selections on the faÃ§ade, the traditional forms work in conjunction to create a final product that is much more than the sum of its parts.